On Wednesday last, the Balwant Singh Hospital laboratory was accredited by the ISO 15198 through the American Association for Laboratory Accreditation, referred to as A2LA. The hospital laboratory was also recognized by private sector parties inclusive of Automotive Industry, American Standard of Mechanical Engineers (ASME) and 11 others. The A2LA is a non-profit public service internationally-recognized accreditation body in the United States that offers laboratory-related accreditation services. The announcement was made yesterday when the management of the hospital hosted a press conference. 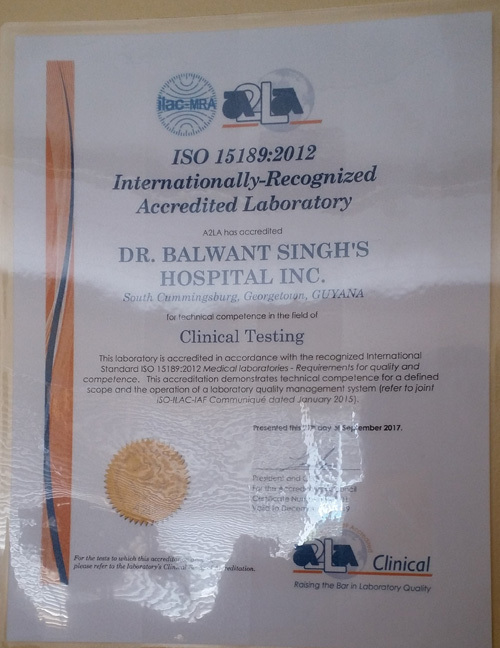 Balwant Singh Hospital spent the last two to three years preparing itself for the accreditation which was given due to its approved and applauded standards. The hospital laboratory was also required to be qualified with certification from the Guyana National Bureau of Standards (GNBS). This accreditation enables customers to better trust the laboratory for the services it provides. Results issued by the hospital laboratory are also recognizable across the globe by doctors. The internationally accredited hospital can now diagnose its patients in a recognized facility. The ISO (International Organization for Standards) 15198 describes a process for manufacturers of in vitro diagnostic medical devices to validate quality control procedures they recommend to their users. She said that with the support of GNBS, the goal was attained even sooner.